Last week we got to enjoy Final Fantasy XV; a game that we had been waiting a full ten years for. This week we have Sony’s own The Last Guardian. Another game that we have been waiting for for years (to the point where many thought it was cancelled), this game is perhaps as esoteric and artful as major game releases come. 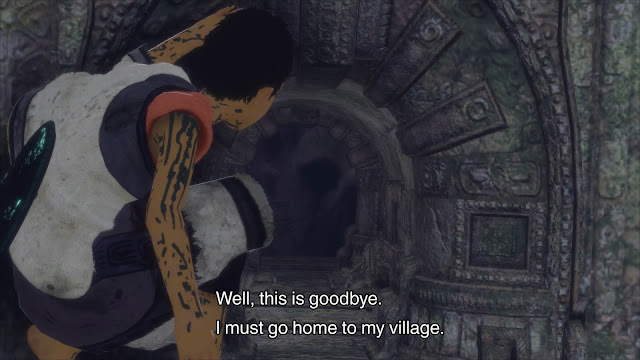 I can’t guarantee that everyone will necessarily enjoy the adventure of the nameless boy and his “pet” beast, Trico, but I certainly hope that everyone appreciates just how potent the game is. The running theme through the entire game is that of mystery, and so it really wouldn’t be fair of me to spoil anything that goes on through the rich, and powerful, narrative. A game of few words, The Last Guardian’s storytelling strength lies in its environmental design and the wordless relationship between the boy and Trico. The environment, a sinister, crumbling ruins, would not be out of place in a Souls game, with the way the decrepit stone pathways and piles of rubble subtly drive the duo ever higher upwards, from the cracking foundations right up into the clouds itself; a physical representation of a journey from ignorance to enlightenment. The difference between the two games is that in Dark Souls you’re in control of a hero who is busily killing everything he or she comes across. 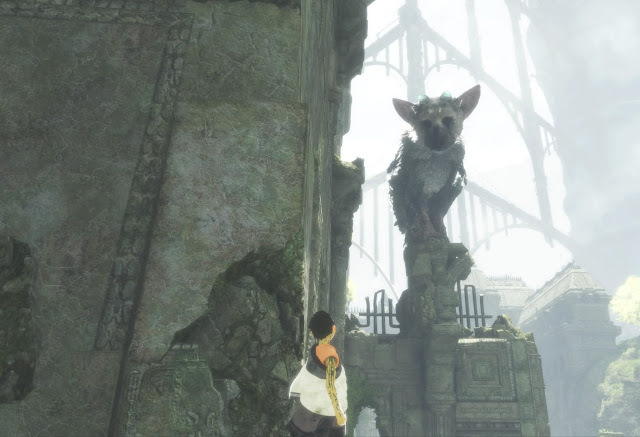 In The Last Guardian you’re in control of a boy clambering all over these monuments of antiquity, or alternatively hanging on to Trico’s feathers and fur for dear life as it leaps around the place. The few enemies in The Last Guardian can’t be dealt with aside from putting Trico between them and the boy, and it’s very much a story of adventure rather than action. The sense of narrative mystery plays out through the puzzle and level design as well, with The Last Guardian refusing to give you any pointers about where the boy and Trico needs to head next. 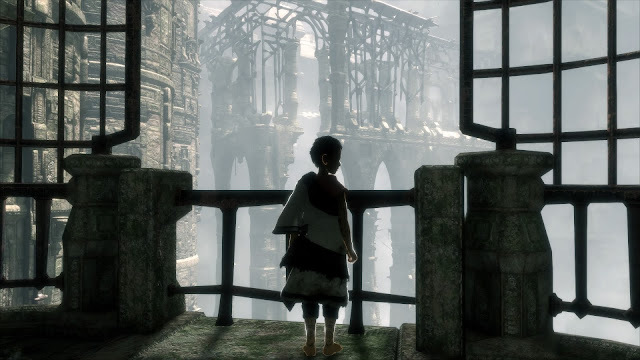 Instead you’ll need to survey the environment, figure out where you could potentially reach next by using a combination of Trico’s size and jumping ability, and the boy’s ability to crawl and climb, and then execute on that strategy. It’s not easy. In fact, in a modern game development world that has become so dominated by developers all but playing the game for you, The Last Guardian feels positively archaic at times. I can imagine people scratching for a button to light up the environments, as in Tomb Raider or Assassin’s Creed, that will tell them what they should jump for next. There’s a definite sense of trial and error with each new puzzle that requires you to pay close attention to the environment, and slowly learn its behaviours, tricks, and traps; often by falling into them. There might not be many physical threats to deal with, but the environment itself takes on that role; it wants to challenge you, frustrate you, and make you want to give up. It is as obscure and unyielding as the narrative itself, which is why each little piece of progress feels earned, and meaningful; the journey is a reward in itself. Trico is a wonderful character, though, and very thematically appropriate to the game. Though he’s a mythical creature, as with a unicorn or phoenix, he’s clearly based on real animals. Which real animals, though, I suspect depends on the person. I’ve spoken to people who find his graceful movement catlike, his puppy dog eyes and moments of more aggressive mannerisms doglike. My personal read on Trico is that he’s based on a fox. Not so much for his behaviours, but because his role in this highly spiritual game is that of a guardian, and if you’ve ever been to Japan you’d know that the overwhelming majority of shrines have large fox statues at the front of them, because to the Japanese the fox is a highly spiritual, guardian animal (and also temperamental and tricksy, which goes a long way towards explaining his behaviour at times when the boy tries to tell him to do things). 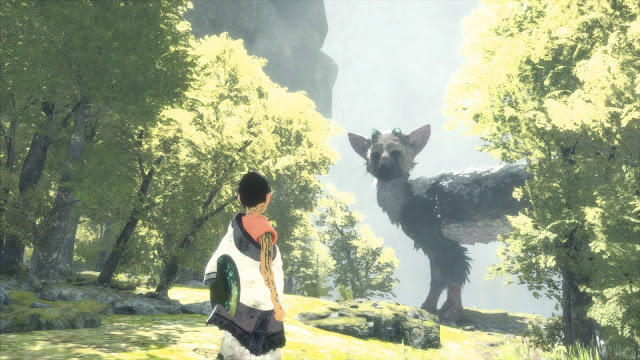 I don’t think there’s a “right” answer to what Trico is based on, which is, again, part of the mystery, and I think it was intended by Fumito Ueda and his team that you’d project your own vision of what Trico is onto the character, as a way of building up an emotional connection with him. So, without giving away the slightest piece of the mystery of The Last Guardian, I do hope that the above gives you a sense of just how emotionally engaging this whole game is. You’re in control of an almost completely unremarkable boy, thrust into a surreal and spiritual world, accompanied by the most remarkable of beasts. It doesn’t take long for the haunting beauty of the world, the fragile innocence of the boy, and the puppy dog eyes of Trico to have you deeply emotionally involved with what’s going on, even as you try and figure out what, precisely, is going on. Ueda’s games have always been incredible in making the simplest of interactions carry the weight of a bond within them; with Ico the powerful emotional bond between the two characters was represented in the way they held hands, and in Shadow of the Colossus the entire emotional weight of the game was built into the subtle interactions between a lonely man and his horse. In The Last Guardian, the ability to press a button to create eye contact between the boy and Trico gives us an almost overwhelming sense of emotion, particularly set against a backdrop that is so melancholic. Months down the track we’ll talk about the game’s deeper themes and narrative, because in addition to being so emotionally affecting, The Last Guardian is a very intelligent game. Spirituality plays a significant role; for example, when the boy dies, a little minigame pops up where you’ll need to mash buttons to make symbols disappear. This is also the very first thing you need to do when you start playing, and when the boy wakes up for the first time, his body is covered in symbols. It all has a point - a strong one - about faith and spirituality, but again in the interest of preserving the mystery, I’ll save that discussion for another day. 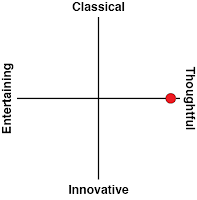 Because I was so emotionally invested in the game, I started to lose time while I was playing it. 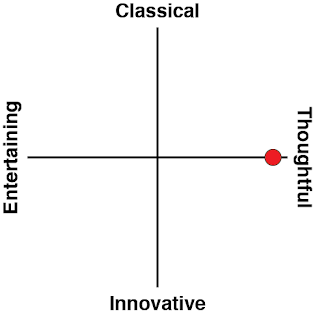 I don’t think it’s an overly long game, but I do think that its length will be wholly dependent on how good you are at understanding its logic and puzzles. It wouldn’t matter if it was over in an hour, though. The game is deep, meaningful, and powerful. It’s reflective, different, and beautiful. It may well end up being more divisive than Ueda’s previous masterpieces, but that doesn’t mean it’s not a masterpiece, from one of the industry’s true auteurs. Play this game. Even if you hate it, it’s going to broaden your horizons around what games are truly capable of.